… as the medieval round says. Congratulations to all students who performed – so many parents and friends and residents said how much they enjoyed it all, from ukulele groups to classical piano, from Taylor Swift to Piaf. I keep coming back to how important I think the twice yearly recitals are for students to hear each other and to know they can play well and share their music with family and friends people. I was amazed at how my beginners came and played for the first time. Well done! It is also about having a goal to work towards. Without a goal, it is easy to never prefect a piece or pieces and then have the satisfaction of playing them well even if you simply do that for the family audience! Chelsea discovered piano at age four upon playing a piano on a trip to Jamaica. Afterwards her father taught her how to play, and a lot of her learning was self taught. She attended Durham School of the Arts from middle school to ninth grade, during part of which time she took lessons from Dr Collingridge to take exams and prepare for her auditions for the UNCSA. She was accepted into the University of North Carolina School of the Arts where she attended until her twelfth year of high school. Chelsea studied there with Dmitri Shteinberg and is now currently at the University of Texas Austin studying with Andrew Brownell. Chelsea was selected to play in multiple master classes at UNCSA with notable artists and competed state-wide when she was young. Lessons are now on a reduced summer schedule which you can see under Summer Schedule. This does not mean everyone listed is coming every week – I have a weekly calendar which tells me that and I will send reminders. Some parents and students owe June fees and given that I am leaving relatively soon it would be great if everyone settled up for June this week. Thanks so much to those who have already done this. I am renaming the Spring Schedule as the tentative Fall schedule until everyone let’s me know what changes need to be made. Looking forward to a great summer with students and then with my daughter and grandson in London in July! The Spring semester for Flourishing Muse studio ended last week on Friday 6/17/16. It was a long semester but I am always so grateful to students and parents for coming to music lessons and allowing me to earn my living in such a wonderful way, doing something I love. Thank you all! The Soirée was wonderful as always. Without so many adults and senior students I thought it might be smaller and I only printed 30 programs! There were so many more people than that there with families and friends and Croasdaile residents. Will print more next time! Thank you as always to Croasdaile for sponsoring my studio concerts – and thank you to Denise Waters, Reverend, sound technician, videographer, lighting expert as well as Life Enrichment Director at Croasdaile. There were too many special performances to mention and I would hate to leave anyone out so I am just going to say that the standard was even higher than in previous year from every single student, in individual performances and in groups. Well done everyone! I have written to most performers individually. Here is the Soirée program which features my granddaughter’s artwork. There will not be a December Soirée this year as I am going to Australia 4-30 December to be with my granddaughters. I am kind of sorry I decided that because the Soirées always make me feel like I understand why I teach. Sharing music is so wonderful and uplifting every time. However there WILL be a BIG soiree June 2017! I have a shorter schedule for summer, just click on “Summer Schedule” to see who is coming when. I am not teaching Mondays and Fridays so i can work on my writing course which is delivered on-line from the University of Western Australia. My daughter is doing the same course with me along with what seems a large number of international students. I do think about “the novel” I am always going to write but this course is hard and involves daily writing. I will send out reminders about lessons because I know summer does not have the same routine as regular term time. I hope everyone has a safe and fun summer, and comes back renewed and ready for more music. If you are going to continue in Fall please let me know as soon as you can. I have the usual waiting list and I have started some people in summer and I know they hope to find a place in Fall. I am leaving the summer schedule up so you can remind yourselves of when you did come in Spring. I will not give away Spring places until I hear from you. 15th Flourishing Muse Soiree will be held at Croasdaile auditorium, Croasdaile Village, 2600 Croasdaile Farm Pkwy, Durham, NC 27705. For best directions go to their website: https://www.croasdailevillage.org/directions-to-croasdaile-village. You enter through the main reception area and take a name tag. Please park in the visitor parking at the side near the flagpole. The Soiree begins at 3 pm and the ukuleles, guitars, recorders and younger pianists will play in the first half. Sadly Jolan Motyka cannot come this year to sing and play her guitar! Other pianists and classical singers will be in the second half. A tentative program will be coming towards the end of this week. All students should have chosen their performance piece by now and should be working hard on it. When you are going to perform for an audience, one of the most important things is to know the piece thoroughly and to have played it so often that you are almost bored with it. I suggest playing it for Mom, Dad, brother, sister, the cat, the dog, the neighbors… the more the better! I do encourage every one to play because sharing your music is such a wonderful thing for your family, friends and the Croasdaile residents. If you feel you cannot play, please try and come to support your colleagues! My adult students are very welcome to play at the Soiree but some decided they wanted work in progress evenings where they can be more informal. The second Adult Work in Progress evening for 21 years and over will be held this coming Friday May 20 at one of the student’s homes. I really enjoyed the first event in this series and seems like the students did too, as all twelve seems to be coming this time! Just a reminder that I will be teaching in summer except for July 20-30 and August 29-September 2. I have a summer schedule up on this blog and it is a weekly schedule but I know people will not be coming every week. If you already have a slot there, let me know the dates you can come come if possible and I will enter them in my weekly dairy. if you don’t have a time and want some summer lessons let me know. I would really encourage the younger students to come in August because the summer break is so long. By August camps are mostly over and bored students could be practicing piano and I will try to make lessons a bit different and have some challenges to work on before labor day and Fall semester begins. Piano Maestro: This is such a fun program on the iPad and really helps with the regular beat of most music and with sight reading. If you are already registered with me, go back and try some of the new songs; if not ask me in your lesson and I will register you – it is free. Students preparing for assessments: Please wish Jake Smedley and Chloe Daniel well for their Music Development Program assessments next week. Jake is sitting for level 2 and Chloe for level 3. Liberty Warehouse documentary: Most of you know that my partner Carol Thomson is a documentary maker. She just had the first showing of her documentary about Liberty Warehouse last friday night. It was very well received and she is now going ahead with finishing the film which will premier in Fall. It was very exciting to see 5 years work up on the big screen, plus a very few of my stills that I took for her (you can’t see when I was holding tripods and being the “roadie”). Phone a friend for a laugh or support before your piano recital. Multiple studies have shown social interaction boosts relaxation and decreases stress, helping you feel more confident and calm by enhancing your feelings of social stability and belonging. A Yale study showed that wrapping your hands around something warm, such as a cup of tea, increases feelings of calm. Why? Stress triggers your body’s fight-or-flight response, drawing blood and heat from your limbs to your core and sending signals to your brain that are interpreted as a sign of distress. Warm them up to switch the signal — and increase feelings of safety and comfort for your piano recital. The endorphins produced during exercise are proven calm-inducers, according to research from Harvard Medical School. Exercising outdoors in nature before your piano recital can boost that serenity. Don’t overlook the importance of a good night’s sleep. Sleep affects not only your physical health, but anxiety and stress. Too little and it can make subsequent nights of restful sleep difficult to achieve, creating a vicious cycle of sleep problems. Make sure to get a full seven to nine hours of sleep for a few nights before your piano recital. Smile, even though your heart is racing… Research suggests smiling and laughter can reduce symptoms of depression and anxiety. Research suggests sugary and processed foods can increase symptoms of anxiety. Kick your cravings and opt for nutrient rich foods, especially those packed with Vitamin B, which improves mental health; omega-3s, which help reduce depression and anxiety; and whole-grain carbs, which help regulate the “feel-good” hormone serotonin. Since most fears involve making mistakes, one of the best ways to beat piano recital anxiety is by knowing your material inside and out. In addition, prepare yourself beforehand by laying out clothes, keys, and any other necessities to prevent any additional anxieties associated with running behind schedule. Lorna’s tip: I have to say that the last one helps me the most. If you are over prepared, like 110% you can lose 10% and still perform very well. I also think being in the present moment and thinking ahead in the music helps me greatly. It is very difficult to achieve, but not impossible! The focus has to be on the music not on yourself. If you allow your brain to start arguing with you about who is watching and what people are thinking and what you look like, you will be nervous and will find performing so much harder. It is inevitable and necessary even to feel some anxiety – gets your adrenaline going – but then you have to be able to cut out distractions and focus on the music. I know how hard that is! I hope everyone has a happy and safe holiday! The ukulele students were so entertaining, with Leo and Ava, Ramona and Sadie singing and playing Beatles songs and I do not know what I am going to follow dueling ukuleles with next time! Sadie your duet was beautiful. Emma you have finally found your metier – very nice playing and next time maybe a duet? Alex you did very well with your song and your voice is getting much stronger – good work. Jolan just beautiful singing and playing – well done. Subi my little recorder player – you are reading so well (especially when you practice) – not long to changing to flute! Tendo – very secure playing and very sensitive – nice work. Vivi – everyone loved raindrops – you were very confident! Mia excellent work on your piece and I love your composition – more coming maybe? Jesse – you did it! I know you were nervous and we will work on that but you did not give up and you finished it – wonderful! Carina – loved your sensitive Sakura. Johnny – great playing and you were well in command of the piano. Jake – everyone loved your amazing grace – you always put your own make on pieces which is how it should be and thank you for always going first in the second half! Jovany – what imagination you have – and what you can do in a very short time with some practice! Now I know! Lia you played perfectly – really well done. Andrew – congratulations on playing very well Andrew and thanks for all your help handing out programs! Chloe – perfect playing as always Chloe – a difficult level 3 piece very well played. Henry – you are so good at that bass line Henry – well done! Quinn – you did the bizarre Bazaar very well and also etude in D minor. I know you wanted to play the River piece but then you did at the DSA concert and it was terrific! Remi – everyone loved your interpretation of The Hills. Well done! Ruvarashe – just beautiful singing RuRu – lovely voice. Viola – Perfect German of course and very secure singing from memory and lovely tone. Michelle and Zoe – mother and daughter, so sweet and you sounded beautiful. wish I had recorded it – next time! Richard – everyone really loved your amazing song and they especially enjoyed the chorus! I have some recordings and videos which I am determined to put up on my soon to be refurbished blog. On December 19, Karsten Huneycutt, one of my adult students, gave a recital at his home. He played two Bach two part inventions, Bach’s C minor prelude and fugue, Chopin’s Raindrop Prelude, Chopin’s C# minor Waltz, and Grieg’s Wedding day at Troldhaugen. It was such an enjoyable program and he had worked really hard in the last year and a half to achieve this level of performance – well done Karsten. On December 17 Quinn Barbaza played Yiruma’s The River Flows in You. It is a very challenging piece, rather too hard for someone who only started piano in January THIS year. I cannot wait to see what he brings me next year and says it is his next piece! Quinn is in piano studies at the DSA and does work hard on basics as well both there and in his private lessons. I am a registered founding teacher with The Music Development Program. It is a wonderful program originating in London at Trinity College. It took root in all the colonial countries such as Australia and Canada and is now here in the USA via the Royal Conservatory in Toronto. The curriculum is very comprehensive and introduces students to a wide variety of repertoire they would not otherwise encounter (such at The Turkish Bazaar Quinn played and the Elegant Toreador that Chloe played). In 2016 Chloe will sit for level 3 and Jake for level 2 and possibly Mia for preparatory or level 1, we will see). Please ask me for more details if you are interested and sorry only piano – wish they had ukulele for my wonderful ukulele players! Most of you know I am a member for the Durham Music Teachers Association (as well as the NC chapter and also the National Music Teachers Association). This coming year 2016 I am the Chair for the Classical Voice Master Class but there are also three other master classes that might be of interest. A Master Class is where a teacher submits one or two students who are ready to perform an item and the clinician, usually a professor of music or an acclaimed performer, gives their feedback and advice. These master classes are free to audience members who might like to come along and support the performers. I always come away from a master class having learned something new. 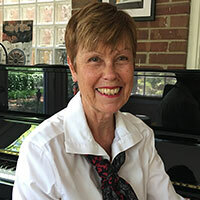 February 6 – 1:00-3:00, JAZZ MASTERCLASS at Durham Jazz Workshop/Sharp 9. Now for a nice break! I look forward to seeing everyone starting January 4. Thank you always for learning music with Flourishing Muse. On June 7, 2015 Flourishing Muse students presented their Spring performances. There were many memorable ones among the program. Roger Daniel videod his daughters so here are some links where you can see them perform. Chloe is a rising fifth grader and learns piano with me (Lorna) and Chelsea (rising 12th grader) is an ex-student, now with teacher Dimitri Schteinberg at UNC School of the Arts, Winston-Salem. I will not be teaching in August when I am away in France (lucky me). Fall semester begins on Tuesday September 2, the day after labor day. If you are continuing lessons with Flourishing Muse in Fall, make sure you secure your time and day soon because I have a waiting list. My primary instrument, as most people know, is piano. I love to teach piano, music theory, and Finale. I also love to teach voice but my own voice is having problems and apparently that is not unusual for someone who has taught as long as I have. Sad, but I am trying to rest my voice over summer (no yelling at the ballgame!) I do teach guitar and ukulele and I love that too but I have my limitations. I cannot teach electric guitar or bass so three of my students are graduating from my studio to other teachers who can teach electric guitar and bass. I wish them very happy playing. My strength in guitar and ukulele teaching is being able to take students to an intermediate level and to teach them to read chords, tablature, and regular notation so they can go on themselves in whatever guitar interests they have, playing in a band, singing and accompanying themselves, playing bass or lead guitar (not my forte). I have had much experience in the past as folk singer/guitarist and with playing rhythm guitar in groups, but no rock and roll! I wish Ii could have some guitar/ukulele groups but space and time do not permit. High Strung and the Guitar Center do provide some group experiences. In the meantime I do want to keep teaching guitar and ukulele but would like students and potential students to know there are limitations on what I can teach. The Spring Soiree is very close – this Sunday June 8 at 2:30 (guitars and ukuleles) and 3:15 (piano, recorder and voice) at Croasdaile Auditorium in Croasdaile Village. All are very welcome. I look forward to the Soiree each year – it really gives students a goal to work towards and it is a very relaxed concert; no judgements are passed and you can always start again! Sometimes the audience sings along!